Christmas, the time of the year to celebrate, to give, to share and to make golden memories of tomorrow. May your hearts be filled with unconditional love, happiness and peace not only for the holidays but in the next days and years to come. 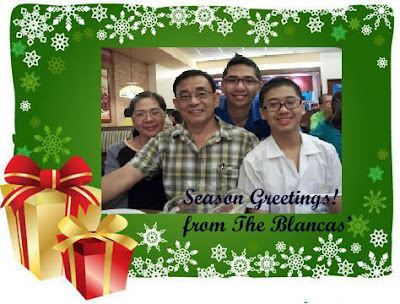 Me and my family wishes you a blessed and meaningful Christmas. May we remember to make merry not only this season but all throughout the year. May the love you share with others return to you in countless ways. God bless you a thousandfold. Merry Christmas! Merry Christmas Mommy Joy and to your beautiful family as well! My love and wishes for a wonderful life ahead to you and the kids Sie :) *hugs* miss you girl!